David Sayer in his England kit. David Sayer’s first game for England ended in defeat today (February 17). 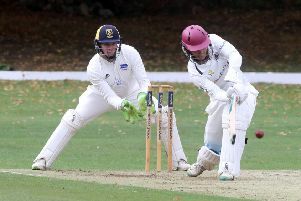 The Peterborough Town fast bowler from Ramsey was playing for England Under 17s in a one-day international against Pakistan in Dubai and it was Pakistan who took the honours by seven wickets. Sayer, batting at number 11, was out for a duck as England were dismissed for 176 in 49.3 overs. He then opened the bowling but failed to make a breakthrough off his three overs and finished with figures of 3-0-13-0. Pakistan reached 177-3 off 35.3 overs. Best individual pefformance for England came from captain Max Holden. The 17-year-old opener from Cambridge, who was a second team regular for Middlesex last season, made 63 from 100 balls. For Iain Brunnschweiler, the head coach, the game was a valuable learning experience, despite the defeat. “Obviously the guys are very disappointed to lose the game today,” he said. “We have prepared well, but for many of these lads it is their first trip away at this level, and today will have been an eye-opener in terms of the standard of the opposition. “The Pakistani spinners bowled extremely well, and although we showed some really good intent, we ultimately lost wickets at vital times, and were short of a competitive total. “There were some good individual contributions, and also we had periods when we came together well as a unit. Overall we were outplayed in all departments, though. The England youngsters have a first chance to show how quickly they have learned in the second match of the one-day series on Thursday, also in Dubai.